The most awaiting Bollywood movie Shamitabh’s second trailer is released. 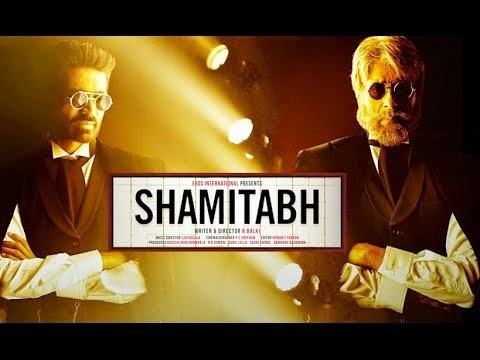 Like first trailer, Shamitabh’s second trailer also creates high expectation and curiousity among Indian movie fans. Starring Amitabh and Dhanush in the lead role and the movie titled with their name, director R. Balki really may felt tough to manage legend Amitabh and actor Dhanush as both showed their extraordinary performance. The second trailer shows Shruti Haasan’s sister Akshara Haasan playing a film director in the movie. Iliayaraja’s music seems to be excellent in the movie meanwhile the maestro is going to celebrate his 1000 film commemoration in Mumbai. Report says Amitabh Bachchan, Kamal Haasan, Rajnikanth, and Shruti Haasan will be attending Iliayaraja's celebration.